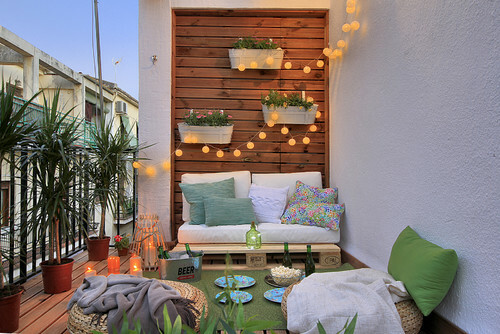 15 Balcony Furniture Ideas So You Can Rock Your Tiny Terrace! If you buy something through the links in this post, we get a small commission at no extra cost to you. Full disclosure here. We hope you enjoy our tips and product suggestions! 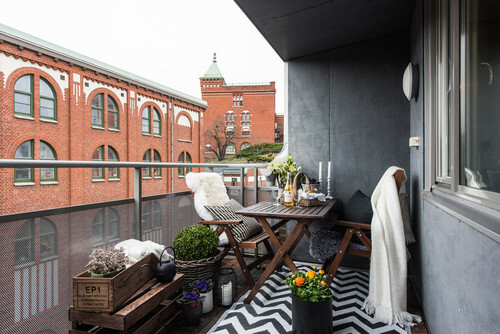 With the right inspiration, you can do big things with every small space in your home, including your tiny balcony. 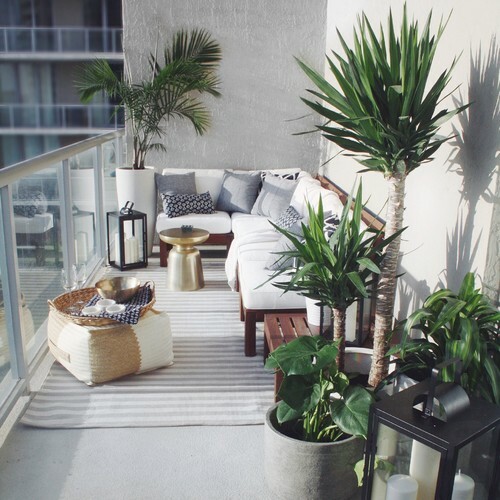 So we’ve gleaned some balcony furniture ideas especially designed for small spaces to help you turn your tiny terrace into the retreat of your dreams! Whether you’re looking for balcony furniture ideas for dining or just relaxing, there’s a range of decor styles here to appeal to every taste. Imagine having a little bistro vibe on your balcony. Some throw pillows, some twinkle lights, a little greenery – it could be the perfect place to enjoy breakfast coffee or dinner wine. Heck, it could be an awesome outdoor work space too! Here’s a diverse mix of table and chair sets to help you get the ambiance you want for your balcony retreat. My favorite balcony furniture idea is simple, affordable little bistro set. It folds up and tucks out of the way when you’re not using it, making it just right for even the tiniest of balconies. Here’s some more reasons to love this little balcony dining set. 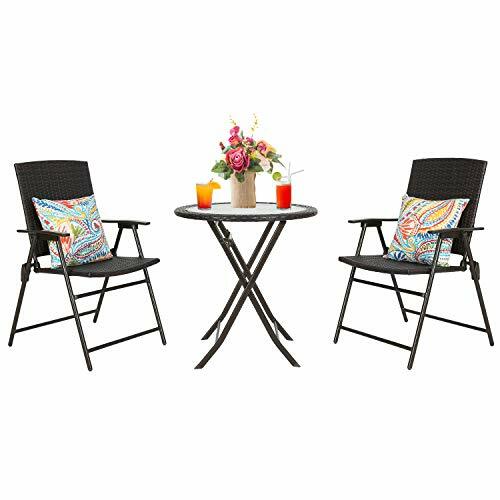 The Grand Patio Bistro set looks great in a variety of decors and comes highly rated! If you like this easy foldaway style but want a little more flair, check out the two cute sets below, with cutout designs. The first one also comes in orange. Buy at Amazon.com Displayed amazon.com price accurate as of 2019-04-20 at 02:30. **See end of post for more details. 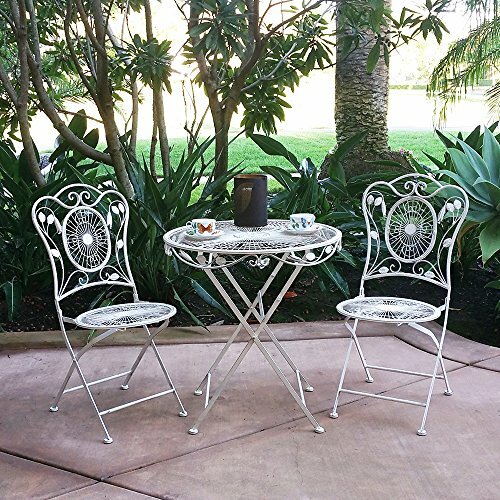 This iron bistro set with crackle finish lends a sort of modern Tuscan vibe to a small balcony. I love the oval shape and the way the chairs fit tightly into it to save space. It would work well right up against a balcony railing – all the better to enjoy the view, if you have one. Here’s a few more features of this balcony furniture set. 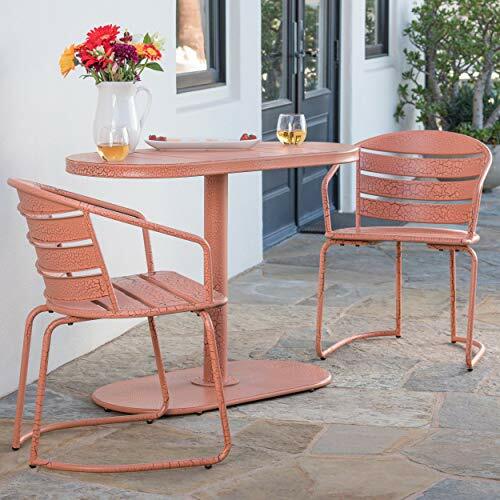 This bistro set also comes in coral and teal. It’s a great little set with a unique look. The larger table area is plenty of room for two and you could even squeeze in an additional folding chair to accommodate a third. 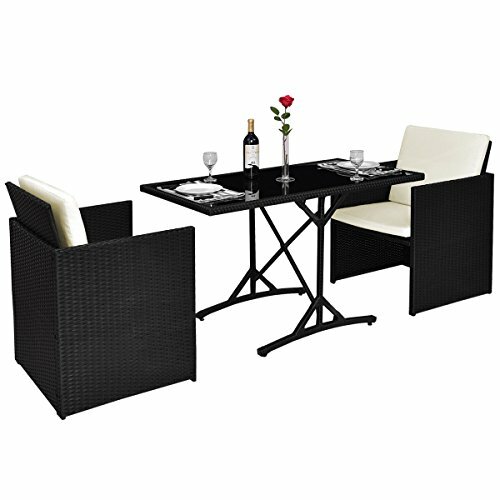 Next up in our balcony furniture ideas for dining is this steel wicker folding bistro set with a wicker finish. 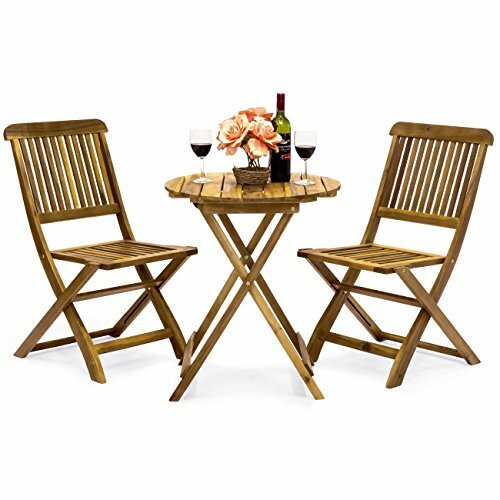 This set is a little more traditional than the prior two, with its glass and resin wicker combination. 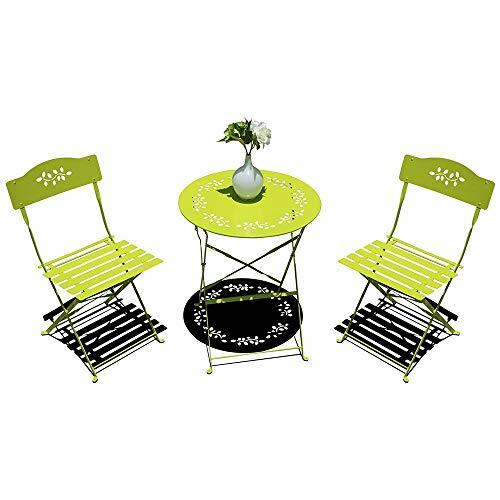 Here’s some more details about this small balcony bistro set. This little set looks great with just about any decor and I really love the warm brown color of it. How about this clever furniture idea for a small balcony? 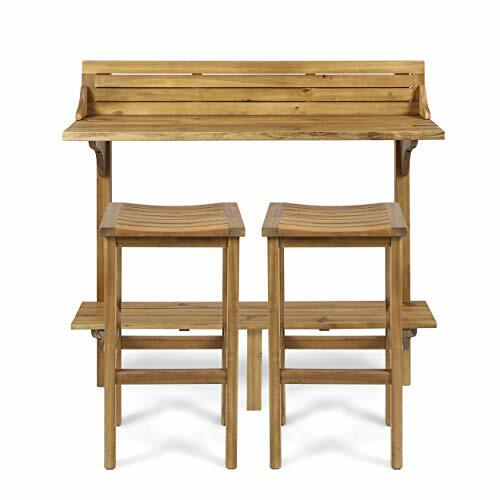 The Bryant Faux Wood Bistro Set is a half table that sits flush against the wall. Here’s a little more info on this smart set from Target. This little half-table set is the perfect way to make the most of the space on your tiny terrace! I love the cheery yellow and blue mosaic of this Classic Iron Bistro Set! It adds charm to a small balcony, don’t you think? 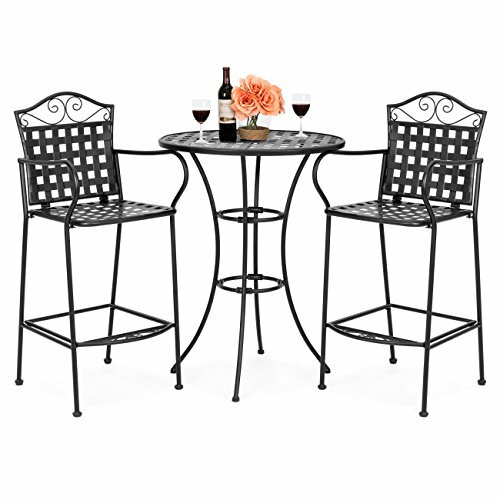 Here’s a few more details about this balcony bistro set. 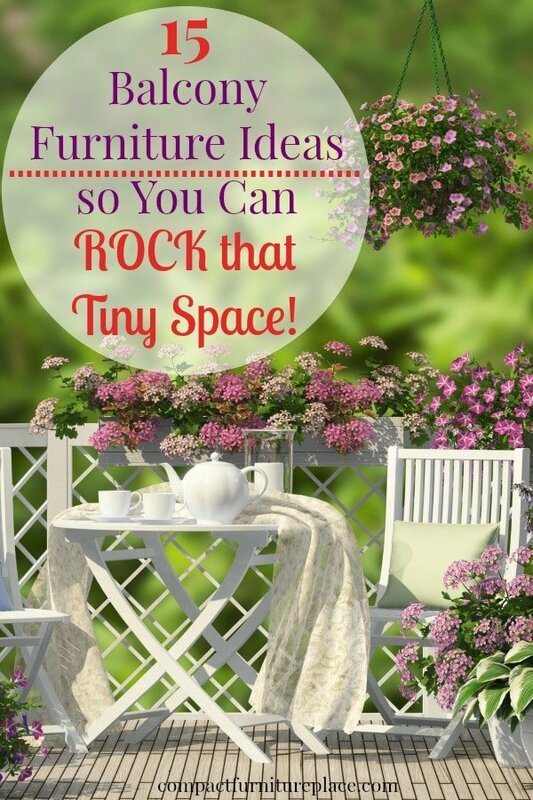 If you want to add a little whimsy to your tiny terrace, this is the perfect set for you! You may also want to check out the set below, which is priced a bit higher, but has more mosaic in it and is just beautiful! 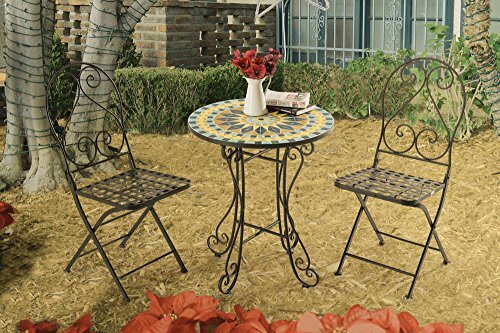 I love this little compact Giantex Patio Set. The chairs tuck completely into it – what an awesome balcony furniture idea! With its glass top and wicker combo, it’s traditional, but the shape of it fits into a modern patio decor. One thing to be aware of with this set is that one chair is slightly smaller than the other. This is so that the smaller chair fits under the larger one when they’re pushed in. Here’s the deets on this small balcony furniture set. This set got great reviews for look, comfort and durability, but a few consumers felt the chairs were too small for a larger adult to be comfortable. Just something to keep in mind. If you’re looking for a small space patio set that’s a little roomier, you should check out the Tangkula compact set below. The seats are a little wider and they have arms, so they might be a bit more comfortable. The table is a little longer too, but the chairs slide right up under it, similar to the Giantex set. Buy at Amazon.com Displayed amazon.com price accurate as of 2019-04-20 at 05:50. **See end of post for more details. 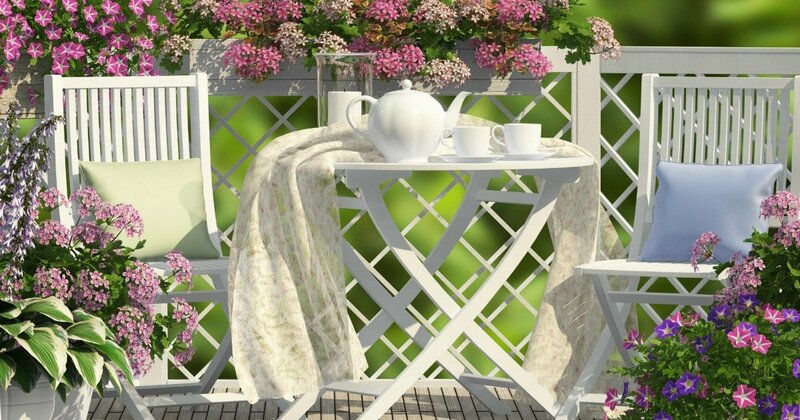 This classic french cafe style patio bistro set is the perfect size for a small balcony. I love the scrolly, floral look! Here’s some details about this pretty little set. The reviews on this set are fabulous, as is the price! If you like this style, but want a counter-height (especially nice if you have a solid balcony wall to see over), check out the set below. 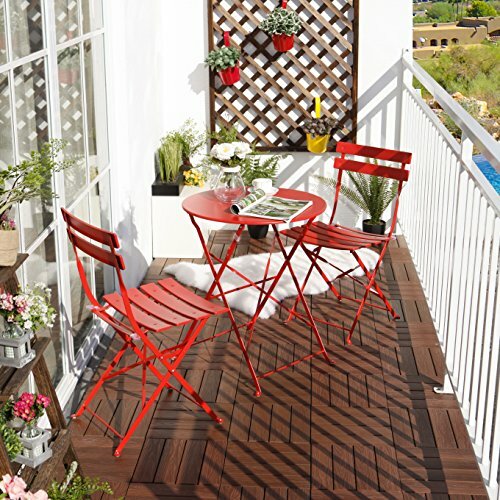 If you like the look of wood, you’ll love this next balcony furniture idea. The Best Choice Products Wood Bistro Set is absolutely charming and would look fabulous with a rustic, country or farmhouse decor. Here’s a few more features of this beautiful balcony set. Acacia wood is naturally resistant to weather and rotting, but you may want to rub it down with some teak oil to keep it looking nice. Unless you like the weathered look, in which case eventually it will weather to a grayish color. Despite the bit of upkeep, this is a beautiful bistro set for the price! Before we get to the last dining set on our list of balcony furniture ideas, I wanted to show you how cute a bistro set like this is with added textures, like soft throws and colorful pillows. Whatever table and chair set you choose for your balcony, don’t forget to add textural elements. Those small touches make a big difference in your balcony decor and really make the space so much more warm and inviting, don’t they? Our last balcony dining set is one of my favorites! The stylish Cassie Wood Balcony Bar Set adds sophistication to your outdoor dining experience. If you have a great view, this balcony furniture idea is perfect for you! There’s even a lower shelf on it so you can rest your feet or display some pretty greenery. Here’s some details of this outdoor balcony dining set. This balcony set doesn’t have many reviews yet, but the ones it does have are excellent. It’s also a fantastic price! This balcony bar set is also very nice, but the Cassie is less expensive. I mean ALOT less. For how great it looks and the price, I think the Cassie Balcony Bar Set is definitely worth a try. 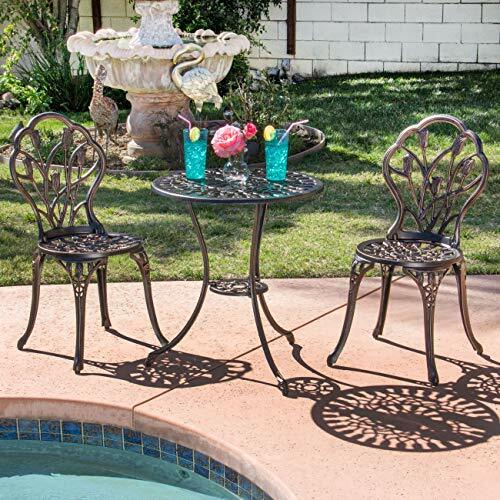 Imagine having your before dinner cocktail sitting at this beautiful Riviera Patio Bar Set. It gives a cool island-bar vibe to your balcony and makes a surprisingly small footprint too. There’s lots to love about this balcony furniture idea! These patio dining sets are a diverse mix of ideas that would work on a tiny balcony. 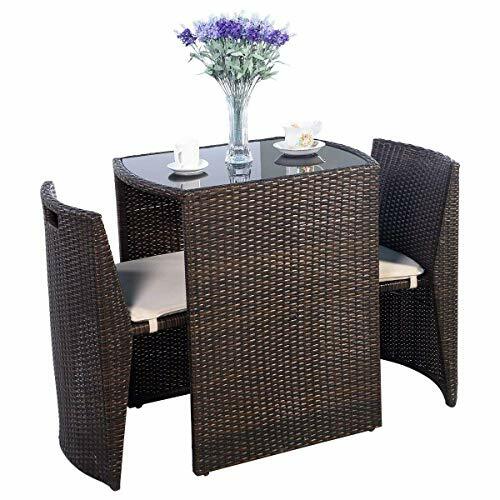 For more balcony furniture ideas for dining, check out this large selection of small patio sets here. Bistro and bar sets are great balcony furniture ideas, but maybe you’d prefer some more casual seating options for your small balcony. Small couches, poufs and chairs add comfort and style to a small balcony and below we have some cool pieces that are just right for small outdoor spaces! Pallet seating is low to the ground and when stacked with cushions, is very comfortable. I love the laid-back vibe it gives to an outdoor space. If you’re up for a project, pallet seating is pretty darn easy to make. Check out this short video to see how to make a patio couch from a pallet. You can simplify it further by not building the back part and just lean back on cushions, like in the picture above. The Tangkula Infinite Combo pieces are a great balcony furniture idea because you can buy the pieces separately and arrange them any way you like. 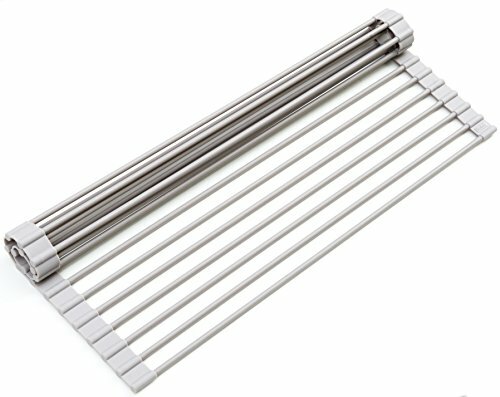 If you check out the reviews, you’ll see consumer photos of the pieces on their balconies and they really look terrific! Here’s some more nice features of this small patio furniture collection. Here are the Tangkula ottoman and coffee table pieces. 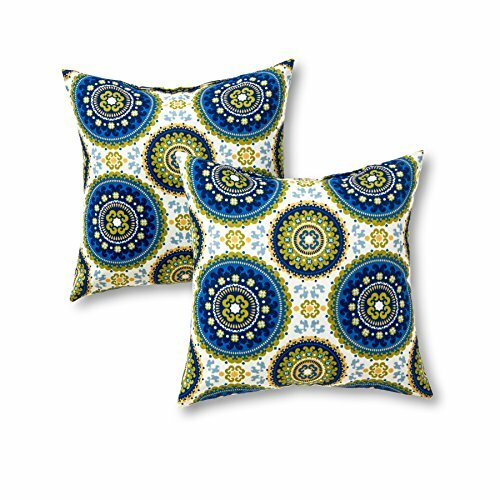 These pieces have a sophisticated modern look with a comfortable feel, so they work well in just about any decor style. 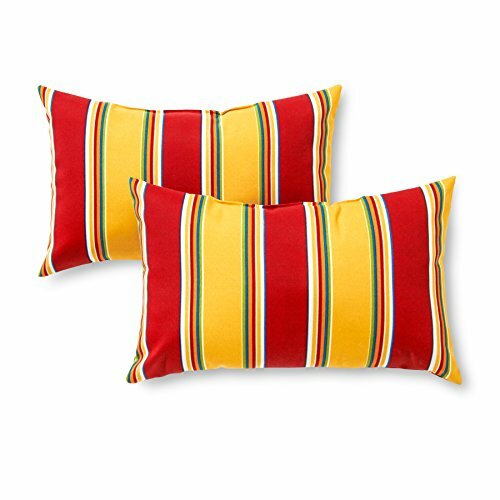 Add some accent pillows for pops of color and you’ll have a beautiful, stylish balcony that will make your neighbors envious! 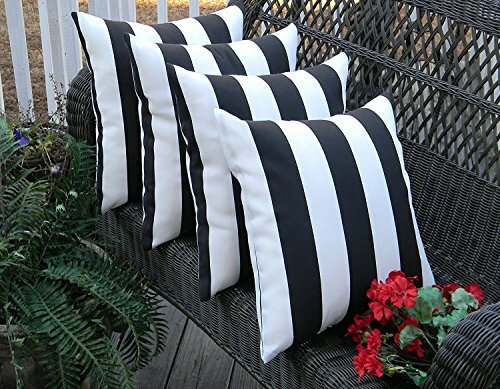 Speaking of outdoor accent pillows, The ones below have fantastic reviews and come in a whole bunch of colors and patterns. 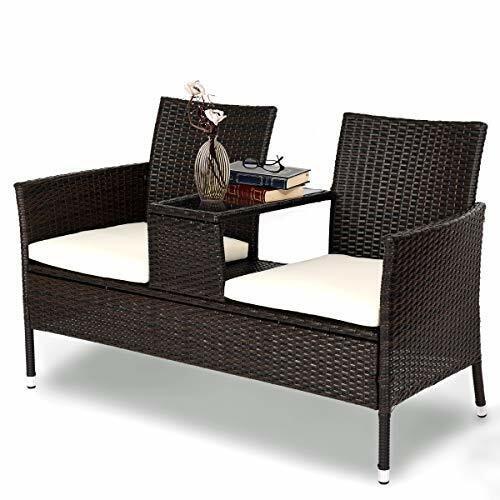 This Halsted 5pc Small Space Patio Furniture set is one of my favorites! Each chair comes with a slide-out ottoman, and the round table has a removable lid for hidden storage. It’s both beautiful and compact – perfect for a small balcony or patio. Here’s a little more info about this set. This one had me at “slide-out ottomans”! It’s a lovely set to cozy up a small outdoor space. 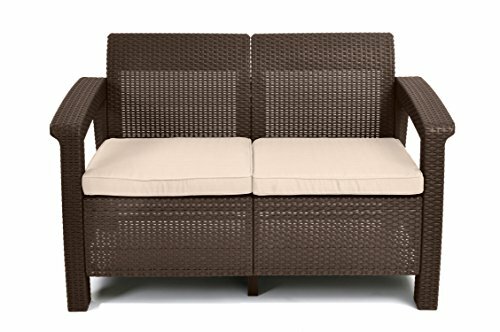 This little Corfu Patio Loveseat is perfect for a small patio or balcony. It’s actually a bit narrower than the Tangkula pieces I mentioned above. 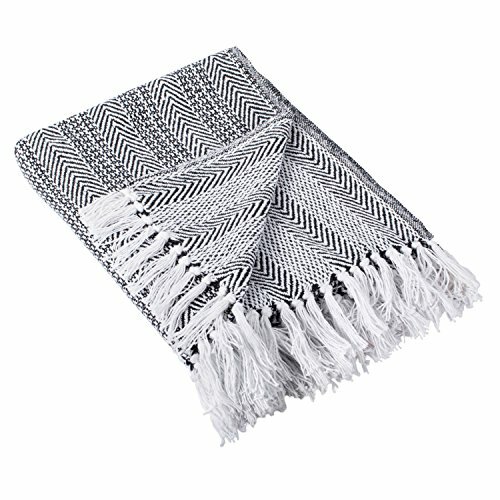 It’s made from durable resin with a woven appearance, like wicker. Super easy to clean and maintain. Check out these details for this balcony furniture idea. 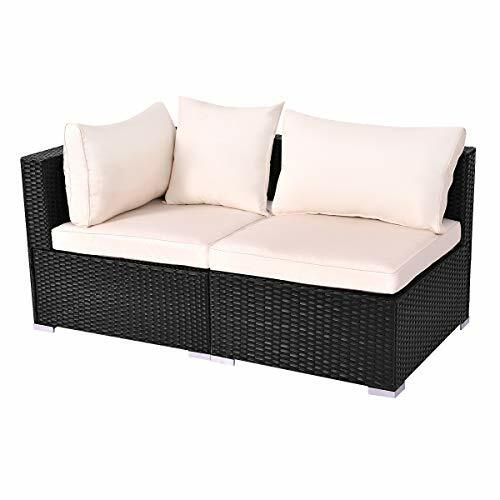 This is a nice piece for some affordable and comfortable seating on your balcony. 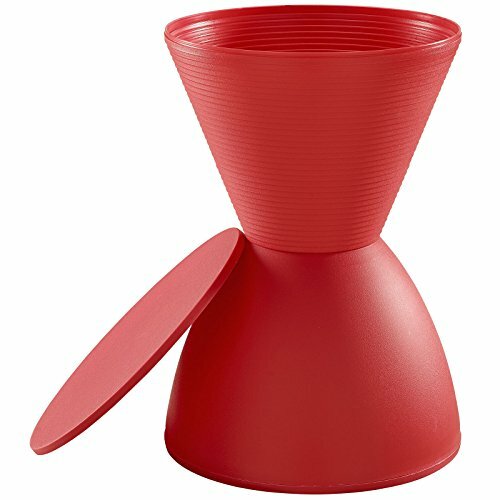 You may want to also check out below, this similar piece from Tangkula that includes a built in drink table. It’s a great price and a sharp addition to a small balcony or terrace. Buy at Amazon.com Displayed amazon.com price accurate as of 2019-04-19 at 17:26. **See end of post for more details. Oh, I love, love this balcony furniture idea! 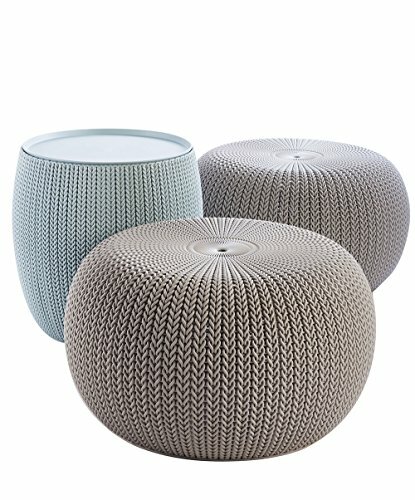 The Keter Urban Knit Pouf Set is casual seating and surfaces all in one. It’s a hard resin material with a knit-looking texture, hence they call it a “pouf”. But make no mistake, these things are durable and made to weather the outdoors! Here’s a few more reasons I’m obsessed with this little balcony furniture set. Table piece is also storage! They fit inside each other when not in use. If you want a versatile, fun, stylish furniture set for a small balcony, this is it! 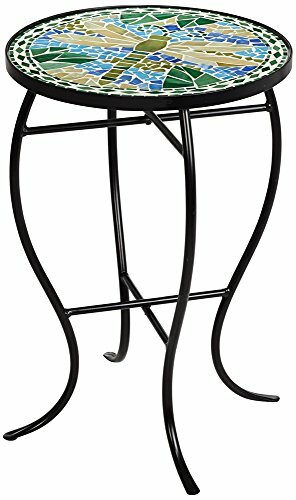 Once you’ve figure out the best balcony furniture to put your keister on, it’s time to find a side table for your cocktail. Or your coffee, Cosmo magazine, Kindle or all of the above. The point is, you need a place to put stuff that isn’t the ground. So below are some ideas for that. I really get excited when I find furniture pieces that are multifunctional because that is exactly what compact furniture is all about! The Haste stool and side table is another great example of this. It’s a modern little stand built for indoor or outdoor use. The Modway would fit a modern or art deco style and can easily be wiped clean and used indoors too. It also comes in green and white.It’s a cool little piece for the price! I do love wrought iron on a patio. 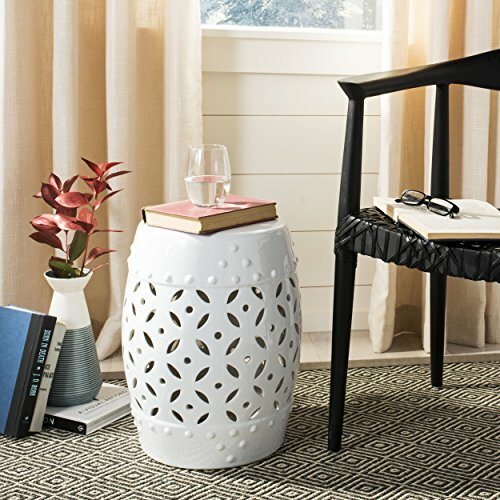 This little Dragonfly Mosaic Accent Table is so pretty and just the right size to hold a few outdoor necessities while you’re relaxing on your balcony. Here’s a few more details about it and the other designs that are also available. You can check out the variety of patterns here. These tables are a lovely way to add some color and artistry to a small balcony or patio. Here’s another small balcony furniture idea that is compact and multipurpose. The Alston Side Table & Stool has a top piece that can be flipped over to make a cushioned seat, can be removed and used as a tray, or can be a raised shelf on the bottom. Talk about versatile! Here’s a few more details about this fun balcony furniture piece. Comfy seat or roomy side table, however you look at, this is a great little balcony furniture idea for the price! Now this is one of the coolest small balcony furniture ideas yet! 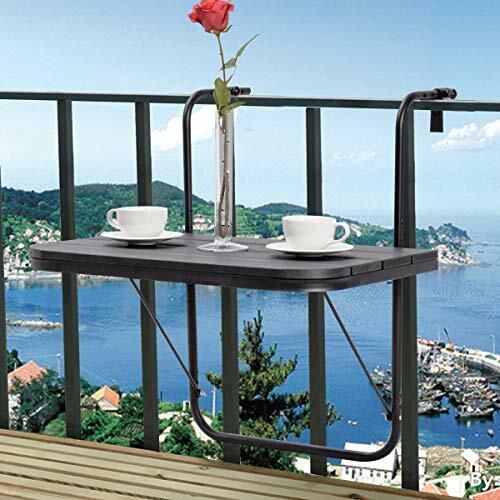 The Tangkula Hanging Deck Table attaches to your balcony railing and can be folded down when not in use. 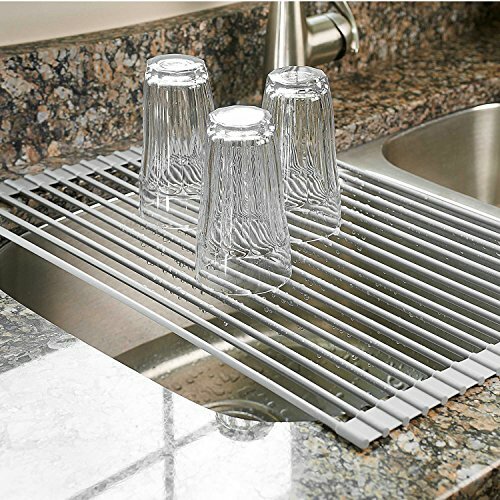 Imagine how handy this would be on a tiny balcony when you’re entertaining! Here’s a few nifty features of this balcony table. Holds up to 66 lbs. This little thing would be an awesome addition to your teeny balcony! If you prefer a wood look, this folding deck table is very similar and is made of a beautiful Acacia hardwood. To end our list of balcony furniture ideas, I want to share this last cool product. 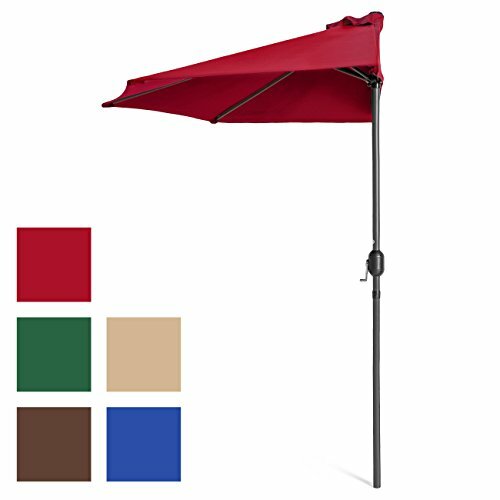 It’s a half-umbrella, designed for small balconies and patios. What a great idea for an outdoor space that has no shade! It sits flush against the wall and comes in several colors. Buy at Amazon.com Displayed amazon.com price accurate as of 2019-04-19 at 19:51. **See end of post for more details. So how will you use your tiny balcony? Whether it’s casual dining, entertaining or relaxing, I hope these balcony furniture ideas inspire you to create a rockin’ outdoor space! Need some more inspiration? Check out these 25 ways to turn your balcony or small patio into a fabulous retreat! **Product prices and availability are accurate as of the date/time indicated and are subject to change. Any price and availability information displayed on amazon.com at the time of purchase will apply to the purchase of this product. I'm Lori and when I'm not hunting for a good under-eye concealer, I love sharing ideas to make small homes more beautiful and functional. Read more about me and the mister here. As an Amazon Associate we earn from qualifying purchases. Amazon and the Amazon logo are trademarks of Amazon.com, Inc. or its affiliates. Certain content that appears on this site comes from Amazon. This content is provided “as is” and is subject to change or removal at any time. We are also a participant in the Target Affiliate Marketing Program, an affiliate advertising and marketing program that pays advertising fees to sites that advertise and link to Target.com. This means that if you purchase something from our ads or links, we may earn a commission. For more details please read our full disclosure.